One of the hardest parts of doing taxes yourself is simply gathering all of the information you need! If you have a side hustle, self-employment income, or are an investor then you’ve probably got quite a bit of tax forms coming to you. If you don’t even know where to start filing your taxes, check out our list of the best tax software! Your first step will be getting your binder plus divider tabs and making sections for specific categories. Make these tabs personalized for your specific situation. Gather all of your documents and place them in the correct divider for easy access. When next year rolls around you can start filing documents as they come in. If you have any rental or self-employment income then you’re going to want to meticulously track your expenses. Since receipts can be a pain to file in a binder a better option is to make copies of receipts, including several on the same page so that you can easily file and organize your expenses. You could also just include a plastic pocket divider for receipts if you don’t want to make copies. Start doing this at the beginning of the year so that you don’t have to search through receipts right at tax time. This is a life saver if you have a ton of expenses to deduct each year. Unless you’re doing your taxes with the same place as you did last year, you will need a copy of last year’s taxes for verification purposes. Even if you are using the same tax prep software it’s still nice to be able to look back and compare different year’s taxes to each other. 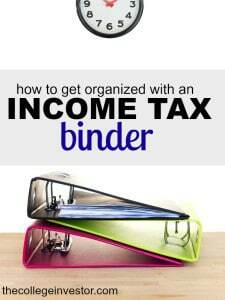 Create a folder or a few tabs where you can place the previous year’s income tax returns. Depending on how thick your income tax return is and how thick your binder is, you can move all of this year’s info to a new tab or you can file everything. At the bare minimum I think it’s a good idea to keep at least the copy of your current income tax return in your binder for easy access. Being organized really is half the battle. Once you have all of your information together the tax prep software you use will walk you through everything else you need to do. Putting this system together doesn’t take very long but can save your hours of searching for certain tax documents. Keep your system together and next year filing your taxes will be a breeze!